The postcard reference in the title of this new duo release from London-based artists Bruno Heinen (piano) and Kristian Borring (guitar) is significant, as there is a background thread which demonstrates the power and influence of continuity; the passing-down of musical brilliance and knowledge to future jazz generations. Bruno Heinen cites Bill Evans – and initially his own uncle Johannes Heinen, a Cologne-based jazz pianist, who gave him a copy of Evans' Sunday at the Village Vanguard – as his route into jazz. At the Royal College of Music, Heinen was until that point focused primarily on his classical music studies, "but that album opened my ears to a whole new way of thinking. I was drawn first to his sound and classical approach. I transcribed most of the solos from that album, and began the work of learning the language." He would later be taught and inspired, as were many others, by John Taylor at the Guildhall School of Music (where this duo first met, on the jazz post-grad course) – and it is both Evans and Taylor that Heinen names as his greatest influences. There's a certain adventurousness in recording an album of venerated Bill Evans originals (as the majority of these ten tracks are); and the concept of piano-and-guitar interpretations seems more daring still. But this collaboration throws a different light on these 1950s/60s treasures with remarkable parity of chordal structure and improvised solo line (so much so that one could almost envisage two interlocked Steinways, were it not for the mellow, often playful breeziness of Kristian Borring's guitar tone). So, in opener Time Remembered, Borring's ascending and descending cadences weave organically into Heinen's opening solo statement before the duo continue to share and intertwine ideas. The skipping melodies of Peri's Scope's (a half century or more later, and sans bass and drums) are invigorated in this charming, levitational reading – a delicate balance which is, nevertheless, always assured; and 34 Skidoo's original, jaunty waltz is painted afresh, in delicate, rain-drizzled watercolour. 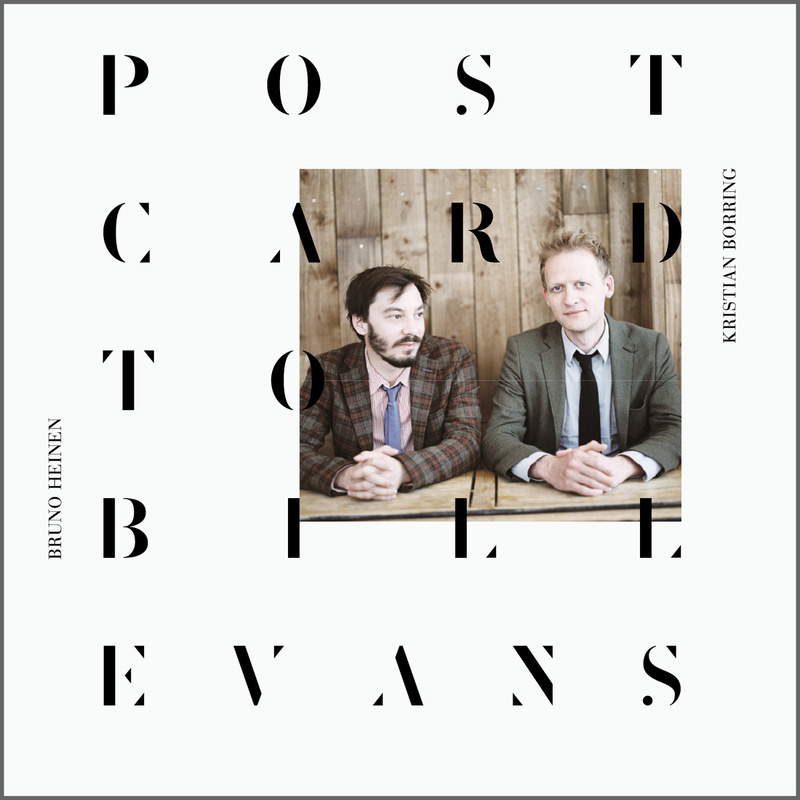 The bluesy swagger of Evans' Interplay is more introverted here, though its new, subtly impish character is defined by the duo's precise, tiptoed interaction; and, in similar vein, familiar Five rolls cheekily to intricately crossing counterpoint and beautifully suggested, non-percussive rhythm. The extended conjoining of Epilogue and Leonard Bernstein's Some Other Time reveals perhaps the most reverential attention to Bill Evans' searching, pianistic persona – nine minutes of glorious, quietly-shifting extemporisation which almost evade time; and Displacement (going back to 1956) again retains the sprightly charm of Evans' original, both musicians tidily scampering with a seemingly innate sense of equilbrium. Heinen's own composition, Postcard to Bill, suggests something of a 'giving back' to the master, as Borring's eloquent solo heralds an amiable, sunshiny outing which could just as easily have been selected from Evans' repertoire – and Heinen's own solo feature here is particularly fine-spun. The sumptuous, Evans-style, chordal rubato of Show Type Tune's piano introduction breaks into blithe, lilting bossa, with Borring's characterful, nimble guitar improvisation and Heinen's high octaves the key to its elegance; and, to close, the warmth of this partnership is magnified in a magnificently swinging, live rendition of Jerome Kern's All The Things You Are (recorded at the Vortex). In an album which declares a deep understanding of Evans' catalogue, there's a real sense of jazz tradition being cherished and passed on, with new life and invention sensitively breathed into it. Full of gradually unfolding nuances, it pleasingly becomes a postcard to keep.